ONE of Spain’s most aristocratic matadors is under scrutiny after he was photographed fighting a bull with his five-month-old daughter under his arm. 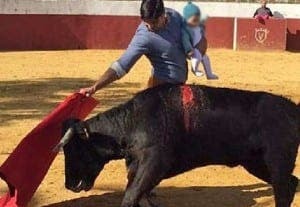 The controversial image captures the Beckham of the bullring Fran Rivera, 42, and his baby daughter, Carmen, alongside large wounded bull, and was posted on his Instagram with the caption ‘Carmen’s debut’. When criticised by social service officials for putting the child at risk, the father of two responded that ‘there is no safer place for her to be than in my arms’. Indeed, it is a family tradition and he later posted a photo of himself as a child on his father’s shoulders as he fought a bull. 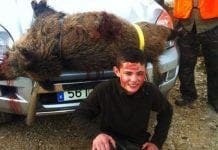 Animal rights group PACMA commented on the ‘shameful’ nature of his actions, and equality minister Maria Jose Sanchez said ‘A fireman wouldn’t dream of taking a child to put out a fire’. Rivera is married to Carmen’s lawyer mother Lourdes Montes, after divorcing the Duchess of Alba’s daughter, Eugenia Martinez de Irujo. This is ridiculous. Spain is getting more like the UK every day with all its health and safety laws etc etc the man is an experienced matador and if he felt genuine threat he would know this prior to entering the ring. I myself proud of the house I built took my 18 month old son on top of the roof, externally to look down on what we as a family achieved. A photograph of this memory we have and will remain part of his and our lives as will this picture in years to come. Some are concerned for the bull’s welfare. You took your son up on a roof, so what, did you stab, torture, cause a slow death and suffering to anybody or anything while you were up there!! NO!! 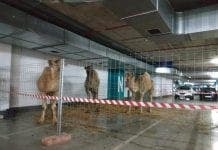 The problem is teaching children that this is ok, to inflict agony upon an animal! Next generation of animal abusers coming right up!! It was child abuse, pure and simple Duncan, on top of the endemic animal abuse involved in bull torture. Hopefully, the grown-up child WILL look back on this incident, but with horror, not pride. Were there any angry bulls on your roof that day?